The McIntosh LCR80 is one versatile speaker. The McIntosh LCR80 is one versatile speaker. 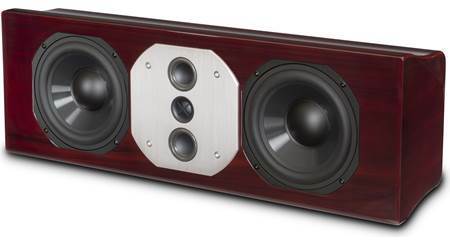 Mount a pair on your wall for powerful stereo sound, or use one as your home theater's center channel speaker. It works beautifully with the voice-matched McIntosh XR50 bookshelf or XR100 floor-standing speakers for crisp, clear movie dialogue and gripping sound effects. You could even place three of them across your home theater's front soundstage to enjoy engaging sound while conserving valuable floor space. McIntosh includes all the hardware you need to wall mount the LCR80 vertically or horizontally, or to place it on a shelf or tabletop. No matter how you use it, you can count on rich, detailed McIntosh sound. You can rotate the McIntosh LCR80's midrange/tweeter array to optimize sound for vertical or horizontal placement. The LCR80's 3/4" titanium dome tweeter and two 2" inverted dome midrange drivers are mounted to a machined alloy plate that can be rotated to ensure optimized sound dispersion for either vertical or horizontal placement. McIntosh places the tweeter between the midrange drivers for a smoother, more even response pattern with spacious imaging and soundstaging. This multiple driver array also provides increased power handling, plus greater dynamic range and output with less distortion since each driver isn't forced to work as hard. The LCR80's high-definition bass comes courtesy of two patented McIntosh 6" LD/HP® (Low Distortion/High Performance) woofers. Compared to conventional woofer designs, these drivers feature an advanced magnetic circuit that significantly reduces distortion while increasing power handling and efficiency. Their rigid, die-cast alloy baskets, four-layer copper voice coils, and polypropylene cones with rubber surrounds act as near-perfect air pistons for fast, articulate bass and superb transient response. McIntosh builds each LCR80 enclosure with non-parallel internal sides to reduce distortion caused by internal standing waves. The cabinets are then completed with premium, real wood veneers with a high-gloss finish for a stylish, modern appearance. McIntosh tops off each speaker with an attractive magnetic grille that features invisible attachments to give the LCR80 a clean, streamlined look when you remove it. Since its founding in 1949, McIntosh has defined the meaning of high-quality sound reproduction, while setting industry standards for superior performance and reliability. 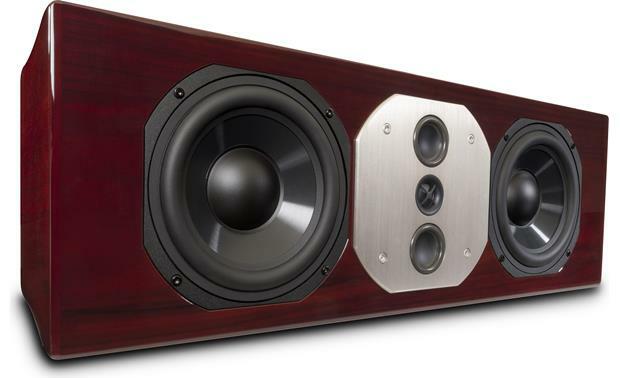 The company is based in Binghamton, New York, where its high-end components and speakers are still individually handcrafted by a team of skilled experts. This uncompromising dedication to quality has made McIntosh one of the most recognized and respected audio manufacturers in the world. LCR (Left/Center/Right) Design: The McIntosh LCR80 loudspeaker is designed for use in a stereo or home theater system; and can be used as Front speaker, Center speaker, Surround speaker, or Surround back speaker. Flexible Mounting Options: With its flexible design, the LCR speaker can be tabletop or wall-mounted, and can be positioned either horizontally or vertically. Mounting hardware is supplied for each mounting option. The patented Rotatable Dispersion Pattern Baffle Board assures the same wide dispersion and excellent sonic imaging whether the LCR80 is positioned vertically or horizontally. 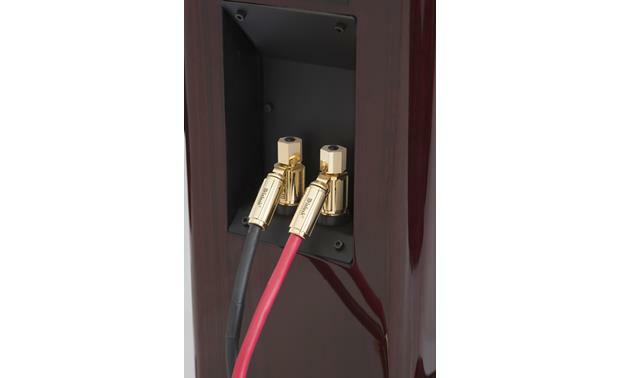 Rear Stabilizer Feet: The two Rear Stabilizer Feet allow you to place the LCR80 speaker horizontally on a flat-surface, like a piece of AV furniture, stand, or shelf. You can reposition the rear stabilizer feet to vary the angle of the speaker from - 11°, 0°, or +11°. 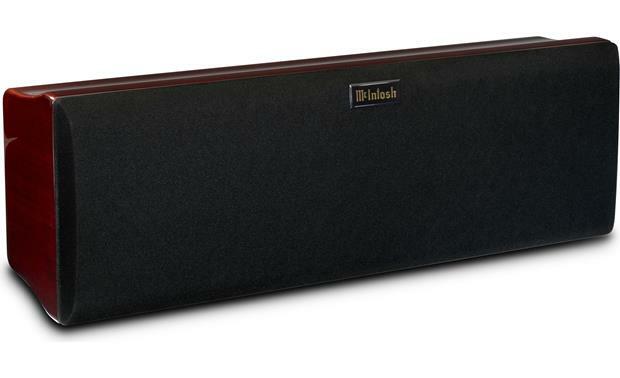 This allows the sound to be directed upwards or downwards toward the listening area. Wall-Mount Brackets: The supplied wall-mount brackets allow for different mounting positions of the LCR80 loudspeaker relative to the wall, both vertical and horizontal. Two positions are flush mount, with the Loudspeaker close to and parallel with the wall. The other position is an angle mount, which places the loudspeaker further away from the wall and allows for rotation of +/-30°, so you can better direct the sound toward the listening area. 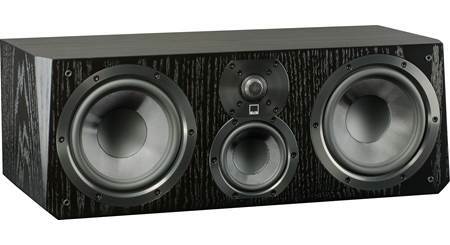 3 Upper Frequency Drivers: McIntosh's LCR80 loudspeaker utilizes 3 upper-frequency drivers. There is one 0.75" titanium dome tweeter and two 2" midrange inverted titanium dome drivers. The tweeter and midrange drivers are precisely aligned on the precision machined mounting plate of 0.625" inch thick aluminum. Their unique layout and crossover design combine high power handling with precise sound-staging. Locating the tweeter between the two midrange drivers generates a symmetrical polar response for superior imaging. Since the audio power is distributed among all the drivers, each driver does not have to work as hard, resulting in greater power handling capability, dramatic reduction in distortion, and greater dynamic range. Neodymium-Iron-Born Alloy Magnets: The 0.75" tweeter and two 2" midrange drivers all employ a neodymium-iron-born alloy magnet. Neodymium-iron-boron alloy has the highest flux density per unit of volume. This allows for a smaller physical size driver and thus closer driver-to-driver placement for improved dispersion. Patented LD/HP Woofers: The low frequency section of the LCR80 loudspeaker consists of two newly designed McIntosh patented LD/HP 6" woofers. The McIntosh patented LD/HP woofer offers increased power handling and produces incredible deep bass with low distortion. The woofer features a polypropylene cone with a rubber surround and has a four layer copper voice coil, so it can perform as a near perfect air piston. The rear vent through the magnetic assembly offers improved heat dissipation. The die-cast basket has an open air area under the voice coil/spider assembly to prevent displacement noise. All together these advances in woofer design construction and materials produce the very important first several octaves of music, with a high degree of accuracy and superb transient response. Precision Crossover Network: The crossover network used in the LCR80 loudspeaker is designed to ensure an even frequency response over the entire audible range. The 2nd order designed network utilizes capacitors and inductors with high-current capacity. The Capacitors used are the low loss (ESR) types. The low-loss (DCR) inductor used in each section of the crossover network has been chosen for high linearity, even at high power levels. This prevents distortion of the music at any frequency. The crossover network also utilizes self resetting high current PTC fuses to provide an extra measure of protection. 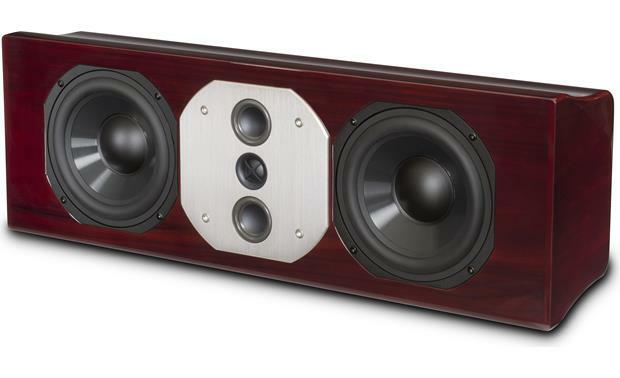 Real Wood Veneer, Rigid Enclosure: The LCR80 loudspeaker's enclosure is constructed with non-parallel internal sides to reduce internal standing waves. It has multiple front-to-back and side-to-side internal braces to form a dampened rigid loudspeaker enclosure. The LCR80 is available in various real wood veneers with a high gloss polyester finish. Fine gloss wood finishes are offered in Black or Red Walnut. These high-gloss finishes and fine cabinetry will be a welcome addition to even the most elegant homes. Magnetic Grille: The custom designed molded loudspeaker front grille is covered with a neutral black cloth and is secured to the speaker cabinet using neodymium magnets. The magnetically attached grill exhibits nearly perfect acoustic transparency. The design of the LCR80 loudspeaker took into account the acoustic characteristics of the front-panel grille and it should be attached to the loudspeaker for the best sonic performance. 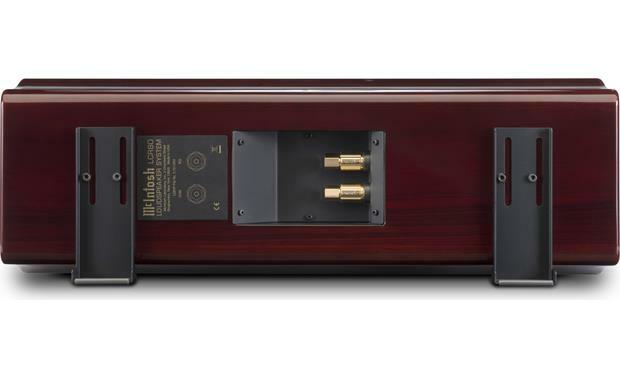 Gold-Plated, Binding-Post Terminals: The LCR80 loudspeaker features McIntosh Patented gold-plated, binding-post terminals to receive high current power & audio signal from your power amplifier, integrated amplifier, or receiver. These binding post terminals will accept large diameter wire (up to 10AWG), banana plugs (single only), and spade lugs. Placement: Loudspeaker placement in a room can greatly affect performance. Placement near a wall, corner, floor, ceiling or any intersecting surfaces will reinforce or diminish some bass frequencies. Try various locations by listening to music containing continuous bass and finding a location where there is an over all musical balance in the sound and the bass content does not dominate. There should be an unobstructed area in front of the Loudspeaker of at least 30 either side from the center axis for the best performance. The distance between the loudspeakers and the listener to the loudspeakers should form an acute isosceles triangle. If the speakers are too far apart relative to the listener, some imaging can be lost. 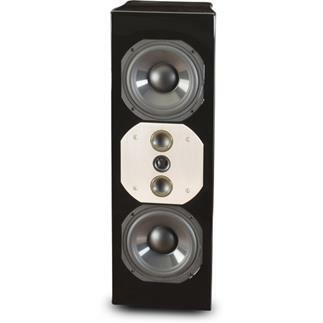 The LCR speaker should also be placed as close to ear level as possible. Loudspeaker Protection: The LCR80's built-in speaker protection incorporates three automatic resetting solid-state devices in the crossover network. One protects the tweeters, one for the midrange drivers, and one for the woofers. Searches related to the McIntosh LCR80 Multi-purpose home theater speaker.